If I have to pick one national park in Western Australia with the best beaches, then I would not hesitate before saying: Cape Le Grand National Park. If you have never heard about it before, maybe because it is located a bit far for "a day at the beach" trip from Perth. It is 50km by road south east of Esperance, which makes it an approximately 800km journey south east of Perth. Depending on your budget, you could either take the TransWA bus from Perth to Esperance, drive there, or fly Skywest before continuing on land. Is it worth spending your precious holiday time going there? The answer would be yes, definitely. Why? Read on and you'll find out. You may have heard friends describe a place they visited as "the whitest beach you can find" only to find out later that it was not so. In this case, it is not a subjective individual opinion. Lucky Bay was voted the whitest beach in Australia through a sand sample comparison conducted by a committee that represents all States and the Commonwealth in soil matters (Esperance Media statement). Of course other states will not leave this unchallenged. NSW claims that Jervis Bay has the whitest beach in the world and we can be sure Queensland has a couple of their own candidates. But no matter, it is enough for us to know that Lucky Bay is beautiful, with dazzling white sand and clear turquoise water, and it's right in our backyard, for us to enjoy whenever we feel like it. Why waste our breath arguing? Lucky Bay is not the only thing that makes this national park special. There are a few other beaches beside and they are all stunning. Compared to the others, Lucky Bay has a bigger stretch of sand, which seems to be popular with 4WD drivers. Cape Le Grand Beach is also open to 4WD. Thistle Cove is one of the smaller but equally beautiful beaches there. If you prefer smaller, more private beaches with no 4WD access, then Hellfire Bay or Thistle Cove would be your cup of tea. The furthest beach from the entrance, Rossiter Bay, has a large quantity of dried seaweed on the shore, which gives it a bit of a surrealistic view. Rossiter Bay is also the only beach with unsealed road access. It feels a bit unreal for one park to have so many fantastic beaches. Photographs don't really do them justice and they have to be seen to be believed. Bring your picnic lunch, plenty of water and a big bottle of sunscreen, and you don't even have to leave for the whole day. There are two main walks in Cape Le Grand N.P., one is the Frenchman Peak climb, and the other one is the Coastal Track. Frenchman Peak is a cone-shape rock with a 1.5km walking track from the base (near carpark) to the top. The slope is not too steep at first, however it gets harder nearer the peak. It's windy at the top, so hold on tight to your camera while you take the pictures of the breathtaking view surrounding you. Allow 2 hours return. Boating and vehicle-based camping are two activities that could be tricky in many far flung national parks due to the unsealed road conditions. It is not the case here, as this national park is serviced by sealed roads on the approach from Esperance as well as inside so that visitors can easily tow their boat or tent trailer. 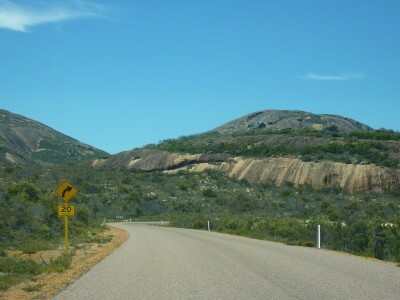 Sealed road in the national park. There are two camping sites, one at Le Grand Beach and the other at Lucky Bay. It's worth mentioning that both are within walking distance from the beach as it's quite rare to find a bush camping site by the beach around Perth. During school holidays, both these sites would be so full that I found it started to get unpleasantly overcrowded. Notices would usually be posted at Esperance Visitor Centre not to expect camping sites here. I found it reassuring to read that if all camping grounds around Esperance are full, the local government would allow camping at the Esperance Showground. For boating enthusiast, boats are best launched at Lucky Bay. You can also launch smaller boats from Cape Le Grand Beach. Beware however that vehicles could easily become bogged in the sand, therefore check conditions prior to launching.